This post firstly appeared on Medium. In the last weeks the total market capitalization of all cryptocurrencies reached a new all-time high over $700 bn, largely been spurred on by recent rises in altcoins. What happened is trivially explained: a lot of people jumped into crypto trading hoping to become (very) rich… quickly. Right now blockchains are almost used for speculation, and it does not require particular skills to get in. You can google for it, joining Facebook groups, passing hours in front of Youtube tutorials. It is not a prerogative of brokers, professional traders, engineers, mathematicians or any kind of scientist. It is a massive democratized gambling that involves minors, workers, retirees and all the unexpected people that the day before were used to buy the lottery ticket. Teams, white papers, technologies, are not (some of) the factors that push a person to buy an alt coin. What drives most of the people is thinking that throwing $10-$100 into some of the several micro coins (when you don’t say shitcoins), that populate the crypto world, could pay off. That’s why unpopular altcoins, like PACcoin (PAC), experienced huge surges in the markets in the last days. Everyone is looking to hitch a ride on a rocket and crush the market. 20% returns are crumbs for the cryptomaniac, 1000% or 2000% or 20,000% returns are those that can give you a Lambo. Last week Ripple (XRP) peaked at more than $100 bn and surpassed Ethereum (ETH) to become second most valuable cryptocurrency after Bitcoin (BTC), risen in value by more than 35,000% over the course of 2017. So, looking at this precedent, what are the potential alt coins that will lead to the moon in the nearly future? Of course no one has the Grays Sports Almanac, but analyzing the current market data we can try to get an insight about the possibility of such an event to happen again, or hoping to see which alt coins should be addressed for a prompt investment. First of all we need benchmarks. Looking at the Coinmarketcap snapshot of January 8th at 1AM, depicted in the following picture, we can trivially see that the biggest market capitalization for a single coin is around $278 bn, owned by BTC, and the average market cap considering the 4th to 10th ranked coins is $20.3 bn. Moreover, the exchanged average volume in 24 hours for the same subset is $733,000. Based on the previous considerations, we can say that a reasonable market capcannot exceed $120 bn (the maxcap) and the minimum 24h volume can be set to $700,000 (the minvolume). 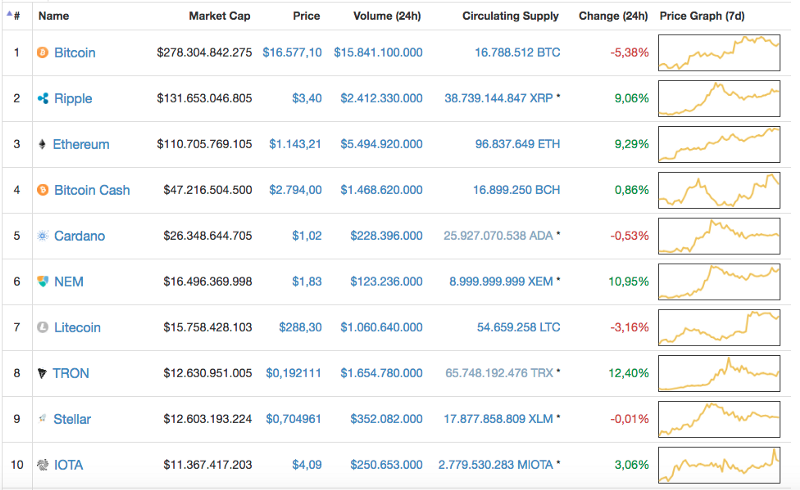 Moreover, we can state that the market cap cannot be less than $100,000 (the mincap) just to take out all the coins that have a small capitalization. Why the constraint on the market cap? Remember, we are talking about speculation: a crypto working like (old fashioned) BTC, which requires mining to be generated, will have low availability and low value during the immediate period after its launch. This can indeed produce high gains for the ones who trust from start, but this has to be seen as something similar to a buy and hold, since energy and computational investment are involved in a coin that is new and that has to manage its way in the market. If we want the easy money and getting the Number One Dime to fastly become Scrooge McDuck, we need a shitcoin that can be traded by lots of people, and that can be attractive to a couple of exchanges. Hence, the most easy indicator is market cap. Lastly, if we want to aim at a return of 30,000% without risking all our money, we should consider to invest $150 (the investment) to getting back $120,000 on success (the return). where price and circulating supply of each crypto are available on Coinmarketcap website or via their APIs. Sincerely, the Ocean’s Eleven above are completely unknown to me. The coins are ranked beyond the top 500. It could be good because one of them could be an interesting project that is not already popular or validated. On the other side, they could be a weird pack of unreliable initiatives. My experiment of course is more provocative then indicative, but I invite you to test it changing the parameters and to give me any feedback about it. Meanwhile, happy (wisely) trading! You can download my free Android app, if you wish to monitor your profit and losses of your altcoins investments, explicitly setting your preferred exchanges for all fiat conversions.